Bus from Ipoh to Kuantan is the preferred choice of passengers because there is no train or flight service available in this route service. The direct bus service is very important for working adults or students who have their hometown in Kuantan. Moreover, many locals like to travel to Kuantan for vacation because Kuantan is famous for its beaches along its coastline. Utama Express and Kesatuan Express are two bus operators offering bus from Ipoh to Kuantan. Kesatuan Express offers 2 daily trips, while Utama Express has only 1 daily trip. Both operators deploy VIP coach to serve the passengers. VIP coach's spacious seating layout provides comfortable journey to passenger during the long hour trip. The earliest bus goes at 10:15am. The following bus schedule is 8:30pm. Please note that there is no bus service during afternoon session. The travel time from Ipoh to Kuantan takes about 7 hours depending on the weather and road traffic condition. At least one stopover will be given for washroom break and buy some snacks. Additional break will be given upon request from the bus driver during the journey. The bus ticket from Ipoh to Kuantan is reasonably charge at RM 44.00. The boarding point for bus going to Kuantan from Ipoh is located at Aman Jaya Bus Terminal. Aman Jaya Bus Terminal is easily access by taking public bus or taxi from Ipoh city to the bus terminal. The arrival point in Kuantan is located at Kuantan Sentral Bus Terminal. 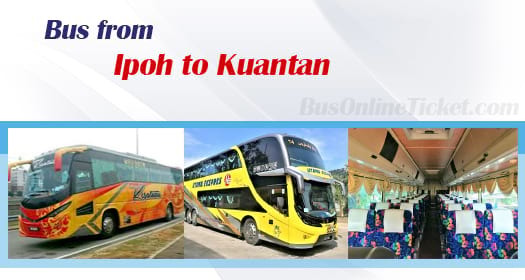 Grab your ticket for bus from Ipoh to Kuantan from BusOnlineTicket.com now. With the instant confirmation, secured online payment environment, and reliability, BusOnlineTicket.com has gained the reputation as the most popular online booking portal among its customers throughout these years.